In addition to the PRINCE2® content, APMP explains how different types of investment appraisal can be used to analyze, in quantitative terms, the value of the investment to be made in the project. In particular, it explains the use of payback, Internal Rate of Return (IRR) and Net Present Value (NPV) as investment appraisal techniques. PRINCE2 identifies Investment Appraisal as one section of the Business Case, lists a range of techniques that are available, but does not explain how to use any of these techniques. In addition to the PRINCE2® content, APMP distinguishes between functional, matrix and project organizations and explains the advantages and disadvantages of each. It also explains the governance of project management and describes the principles of governance of project management. In addition to the PRINCE2® content, APMP explains several additional quality techniques and also describes the related topic of requirements management and explains the importance of this topic. 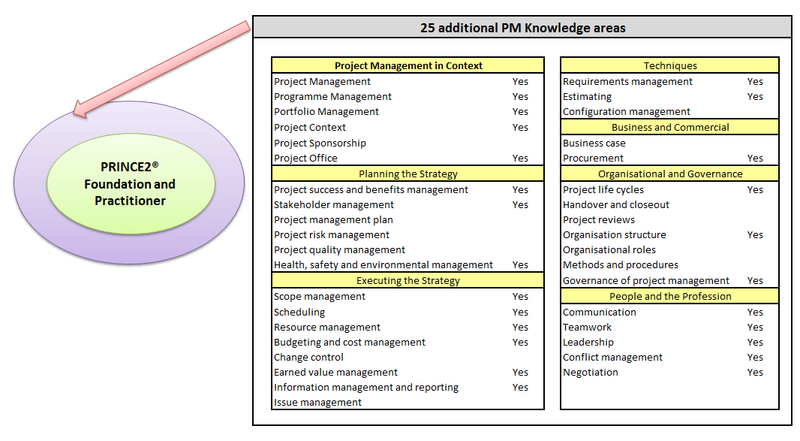 In addition to the PRINCE2® content, APMP provides a how-to approach to each step of the above approach, explains scope management and describes the Product Breakdown Structure (PBS), the Work Breakdown Structure (WBS), the Cost Breakdown Structure (CBS), and the Organization Breakdown Structure (OBS), and explains the reasons for using a Responsibility Assignment Matrix (RAM). Explains how a project schedule is created and maintained by using techniques such as precedence diagramming, critical path analysis, Gantt charts, the Program Evaluation Review Technique (PERT) and milestone progress charts. Also explains the advantages and disadvantages of using software tools for scheduling. APMP explains budgeting and cost management and the benefits of this topic. Describes the practical problems of estimating across the project lifecycle and explains bottom-up, comparative, parametric and three-point estimating. In addition to the PRINCE2® content, APMP covers tools and techniques for risk identification and the use of a probability and impact grid (matrix) to assess risks. Also explains the importance of health, safety and environmental management, as these can be considered as specialist aspects of risk management. This includes topics such as the purpose of regulations, the duty of care for and responsibilities of a Project Manager. In addition to the PRINCE2® content, APMP describes Earned Value Management (EVM) as a means of progress monitoring, explains the advantages and disadvantages of EVM, and explains how to perform earn value calculations and interpret earned value data. Also explains information management systems covering the collection, storage, dissemination, archiving, and appropriate destruction of information. Whereas PRINCE2 describes the project lifecycle using its process model, the APM Body of Knowledge describes different phases of the project lifecycle. These different approaches are broadly compatible. Explains the importance of effective • communication in project management and explains the typical barriers to communication and how they may be overcome. Describes a negotiation process • and explains each stage within this process. Explains sources of conflict in the project lifecycle and explains a conflict resolution model. By now, I hope that any PRINCE2 Practitioners, who do not already have the APMP qualification, will be seriously considering extending their studies. However, before I describe what that might involve, it's time for the health warning. I did mention earlier that APMP and PRINCE2 are sufficiently compatible to be considered ideal partners. But no partner is ever totally compatible with the other, and this is true of APMP and PRINCE2. A more detail brochure is available (9 page pdf document) from our offices or can be downloaded from our web site.